for a list of available plot options. lsimplot(sys1,sys2,...) opens the Linear Simulation Tool for multiple models sys1,sys2,.... Driving inputs are common to all specified systems but initial conditions can be specified separately for each. simulates the response of a single-input model sys to the input u(t)=sin(t) during 5 seconds. For discrete-time models, u should be sampled at the same rate as sys (t is then redundant and can be omitted or set to the empty matrix). 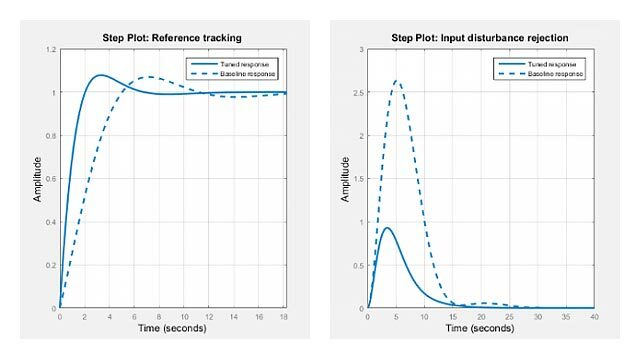 For continuous-time models, choose the sampling period t(2)-t(1) small enough to accurately describe the input u. lsim issues a warning when u is undersampled, and hidden oscillations can occur. lsimplot(sys,u,t,x0) specifies the initial state vector x0 at time t(1) (for state-space models only). x0 is set to zero when omitted. lsimplot(AX,...) plots into the axes with handle AX. For continuous-time models, lsimplot(sys,u,t,x0,'zoh') or lsimplot(sys,u,t,x0,'foh') explicitly specifies how the input values should be interpolated between samples (zero-order hold or linear interpolation). By default, lsimplot selects the interpolation method automatically based on the smoothness of the signal u.